All of our Whimbrels and Tattlers are now in Russia, some have reached their breeding sites while others are still on the move. After all the perfect demonstration of “site fidelity” by KU throughout its northward migration this year, it might not be a surprise that KU has chosen the same breeding site as last season. 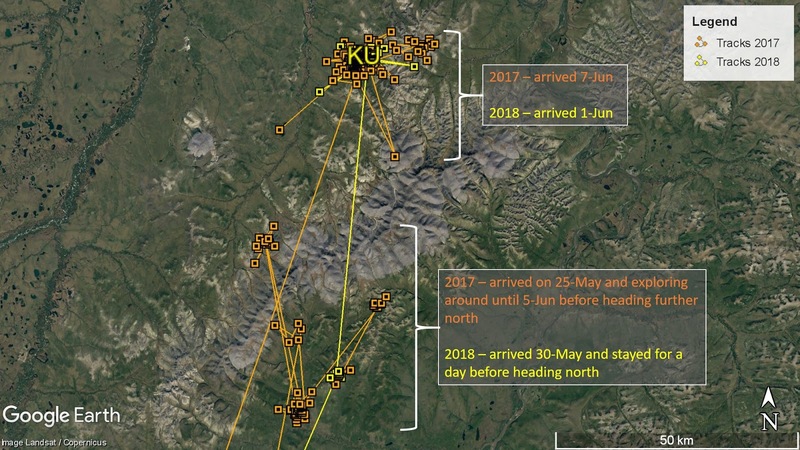 KU reached its breeding ground on 1-Jun-18, the date of arrival is a week earlier than season 2017. Fig 1: KU’s northward migration track in 2017 and 2018. After leaving Liaoning Province on 19-May, KU stopped over for a short stay of 2 days in Heilongjiang Province before crossing the China-Russia border on 25-May. From 4pm to 10pm on 25-May, it was flying at a speed of nearly 60km/h. In 2017, KU spent more than 10 days around the mountain range area before deciding upon its breeding site. This year, it headed straight to its breeding site after resting for a day at the southern side of the mountain range. It is hoped that KU will soon settle to breed. Fig 2: KU’s movement around breeding site before start breeding in 2017 and 2018. Third-year Whimbrel LA, which is heading to its breeding ground for the first time in its life, is still trying to decide upon a sutable breeding site. 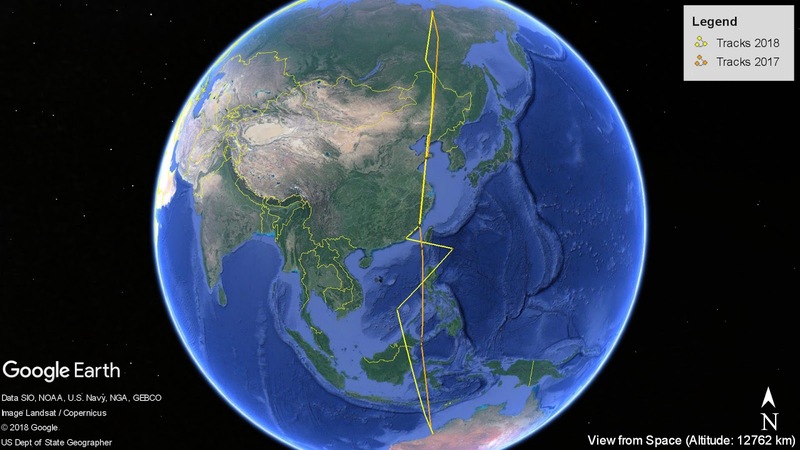 After leaving Panjin in Liaoning Province on 24-May-18, it flew for 4 days for 2,790km to reach northern Khabarovsk Krai in Russia. Since then it has migrated slowly by stopping at 4 sites before reaching Chukotka this morning. Hopefully LA will soon decide where it is going to breed. Unfortunately, signal from our third Whimbrel JX has ceased since 20-May in Heilongjiang. It could not be determined whether this is due to breakdown of the tag or the death of the bird. It is known that hunting in Russia during spring passage has resulted in the deaths of a number of migratory shorebird each year. 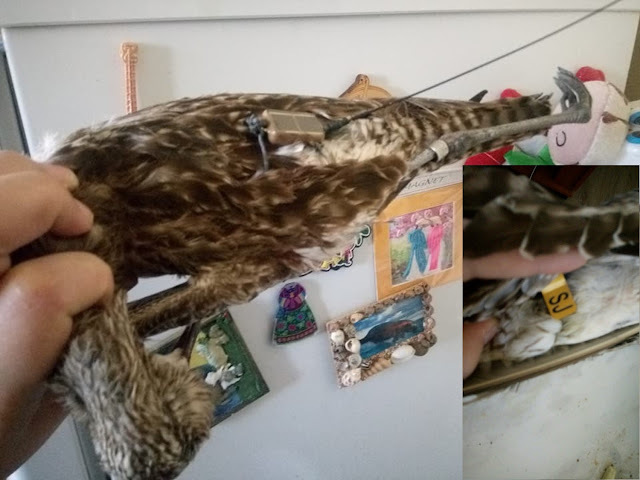 It was sad to know that satellite tagged Whimbrel SJ from Broome this year was found dead from shooting. Satellite tags were deployed on SJ and 4 other Whimbrels at Broome in February this year under a collaboration project between Fudan University and AWSG. The body of SJ was found on 30-May after signal transmission ceased on 27-May in Sakha Republic, Russia. This story might only be the tip of an iceberg of the threats from hunting that migratory shorebirds are facing. It is hope that the situation would eventually improve through international cooperation, education and advocacy work. All 4 tattlers proceeded to Russia in the last week of May. 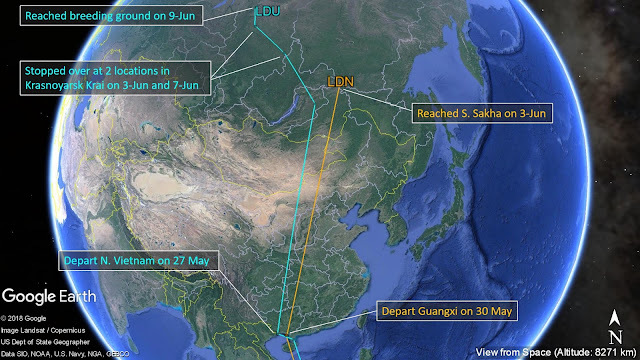 The first tattlers to set off is LBX which left the Fujian coast on 24-May after stopped over for 9 days. It then flew continuously for 6 days to reach an estuary in Khabarovsk Krai in Russia. 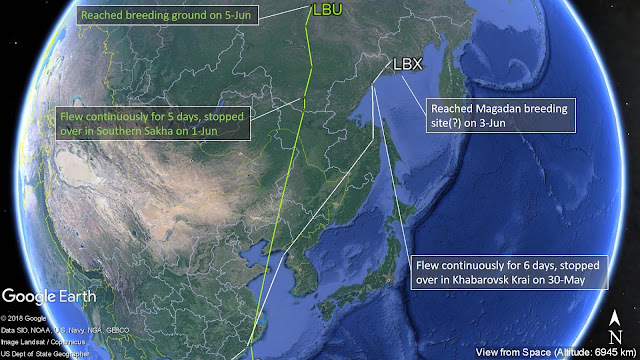 After resting for a day, it continued to fly north-east to reach Magadan and apparently starting to breed. Similarly, LBU, which also stopped over in South-east coast of China in Zhejiang Province, departed 2 days later and flew >3200km to reach southern Sakha Republic. It then continued flying north to arrive its breeding site on 5-Jun. LDU departed North Vietnam a day later on 27-May. It has taken an inland route to arrive Krasnoyarsk Krai on 3-Jun. 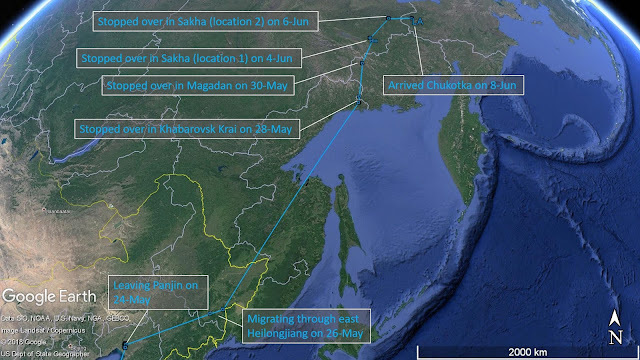 After stopped over at 2 locations in Krasnoyarsk Krai for a day each on 3-Jun and 7-Jun, it then flew north to reach breeding site on 9-Jun. LDN was the last Tattler to depart for Russia. It left Guangxi Province on 30-May and reached Sakha Republic on 3-Jun. It apparently is still flying to find its breeding site on 9-Jun.